Natural products contain a rich source of compounds that has several applications in the field of medicine and biology. A number of herbal plants have shown promising results, and several herbs and minerals used in ancient medicine have led to the identification of numerous medicinal plant compounds with anticancer effects like antiproliferative, pro-apoptotic, anti-metastatic, and anti-angiogenic that have been shown in in vitro experiments or animal studies. But only a small number of them have been tested in cancerous patients, and so limited evidence exists for their clinical effectiveness. A number of common herbal preparation like curcumin, resveratrol and Viscum album, green tea, pomegranate extract, grapes extract, and many new compounds with diverse structure, more selective, and less toxic activity have been isolated from plants that are considered potent anticancer agents. Several herbal preparations containing multiple phytochemicals have been prepared like PC-SPES, with the belief that these would work better than a individual phytochemical. Cancer being associated with high mortality rate can be cured successfully with natural products which have less side effects than the synthetic drugs. 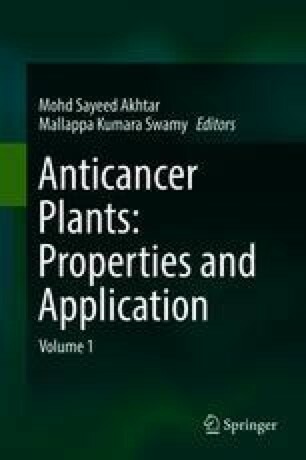 The aim of this chapter is to provide an overview on some of the herbal plants and their compounds, which have been associated with cancer cases and undergone a prospective clinical investigation for identifying anticancer properties either in vivo or in vitro.